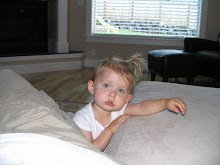 iLife: Life on the Other Side - In Pictures! Life on the Other Side - In Pictures! 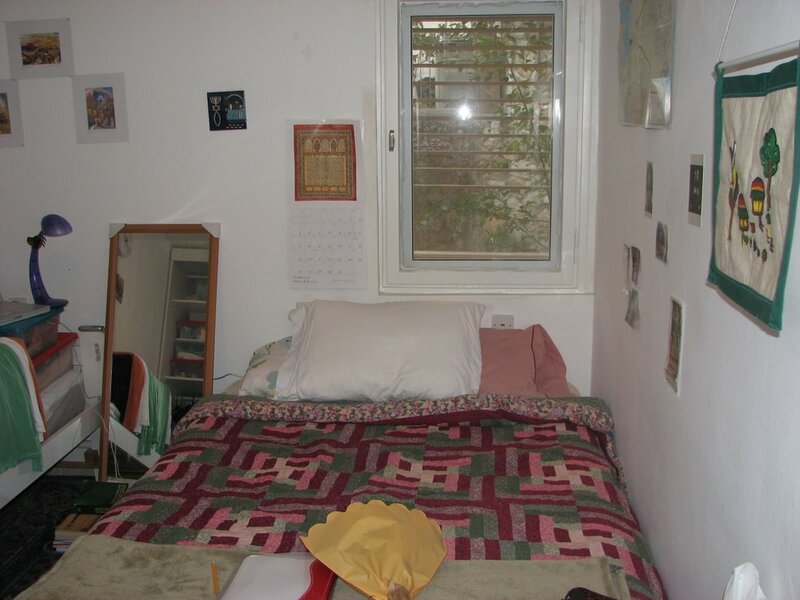 This is, fortunately or unfortunately, the only physical proof (despite the possibility of using photoshop to create a semblance of reality) of my being in Israel. 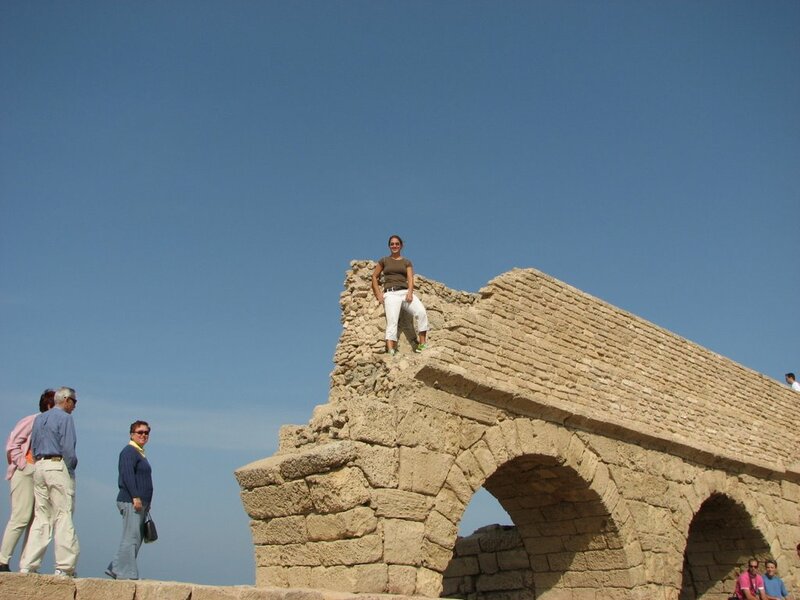 It was taken on my first weekend in the country at the archaeological sight of the Roman/Herodian aqueduct in Caesarea, on the Northern Israeli coast. It was built to bring water to the city of Caesarea, which was built as an administrative center by King Herod in honor of...you guessed it, Caesar (specifically Caesar Augustus, or, more formally Divi Augusti Octavianus, 'the divine Augustus, formerly known as Octavian', or something like that). My friend Nancy, who is also my landlady, took the picture as I stood on top of the aqueduct. 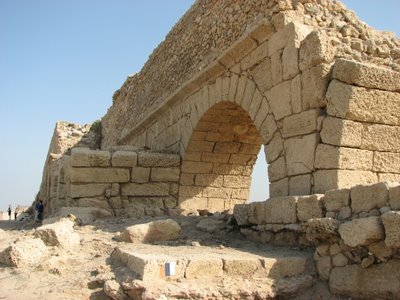 Here is another picture of the aqueduct, from another angle. Neat, huh? The Romans were masters of architecture and of bringing water to remote reaches of the Empire in order to facilitate a sort of globalization of the ancient world. Judea was no exception, especially because of the construction projects of Herod the Great, who is famous for being the greatest builder and developer of the Roman period, among other things. After visiting the aqueduct, we went to the real site of ancient Caesarea. According to Josephus Flavius (the most prominent Jewish-Roman historian of the ancient world), King Herod 'built a harbor where there was none'. He literally constructed a place for ships to come in and out in the middle of the coastline, where no natural harbor existed in that area. He also built a quintessential Roman-style city, complete with an amphitheater, a hippodrome for gladiatorial games and horse races, a temple to 'Rome and Augustus', a subterranean sewer system 'which automatically flushed itself with the sea tides', and an administrative center from which the Romans would rule Judea after Herod's death. This is the site where Paul was questioned by Agrippa and Festus and requested to be tried before the emperor (as he was a Roman citizen and deserved such just treatment not accorded to non-Roman citizens) and where the first Jewish revolt against Rome (66-73 CE) began after conflicts between the Jewish and non-Jewish residents of the city erupted into violent riots. After the 20,000 Jewish residents of the city were slaughtered by the Greek residents (number probably inflated by Josephus), the city was completely Roman/Greek, i.e. 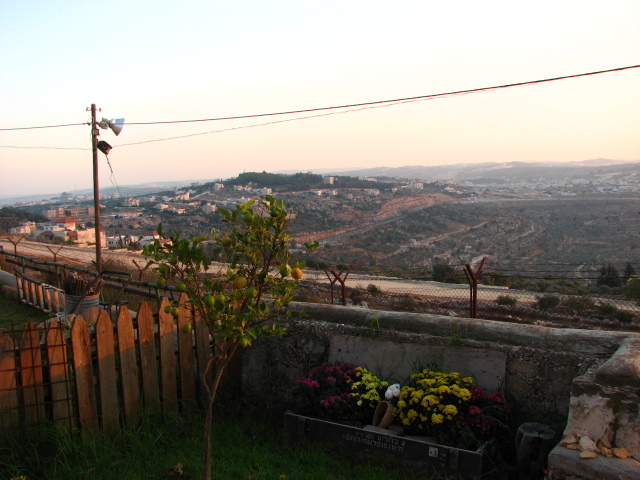 non-Jewish in a Jewish land. 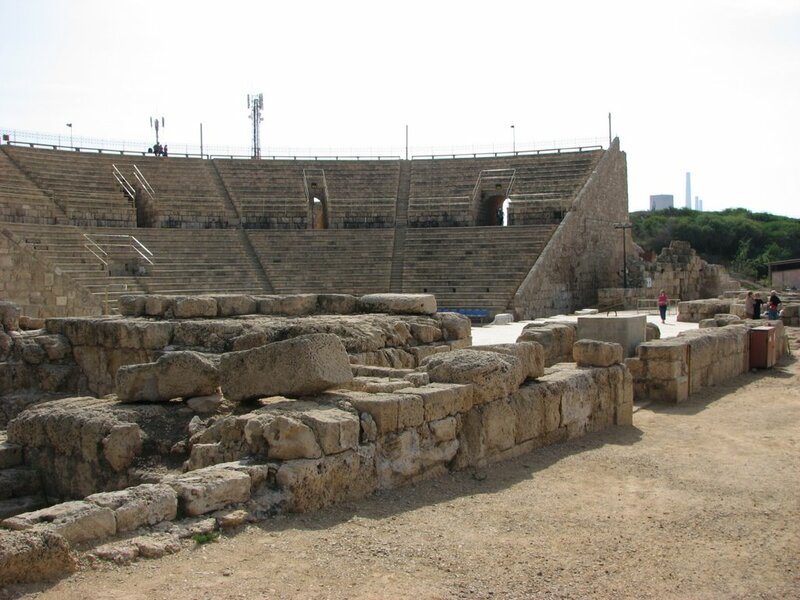 Below is a picture of the hippodrome (think horse racing scene from Ben Hur). 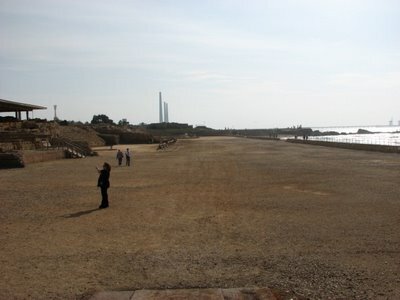 The seats are on the left in the picture, and they faced the Mediterranean directly opposite. If you look in the middle of the track, you can see the center structure, around which they raced. The picture is taken from the starting gates. 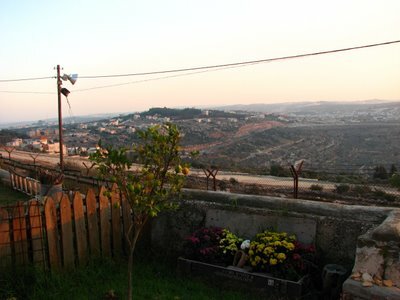 Here also are some pictures of my room and of the view from the backyard of the house in Har Gilo, where I live. Notice the barbed wire fence. Har Gilo, technically on the Arab side of the 1967 Green Line, is a settlement which has been annexed by Israel. 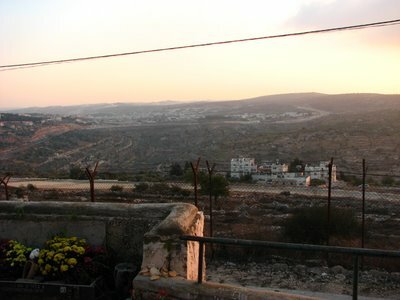 The town in the forefront of the first pic is Bethlehem, and Hevron (which is unclear in the picture but is a straight-shot south from B'hem) is past it. I will post more about Har Gilo later. Well, have to get up early for ulpan tomorrow, so that's all for tonight. Later!